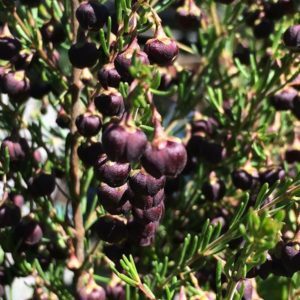 A few well known native plants are standouts for fragrance and perfume, the Lemon Scented Myrtle (Backhousia citriodra) and Boronia heterophylla being two. If we look at different types of plants, you will find fragrant native plants ranging from grass like tufting plants, to climbers, ground cover plants to shrubs of all sizes. A number of trees including many Eucalyptus species also have good fragrance. In this article we look at some of the best from each category. Grass like and Tufted Plants. Two lilies spring tp mind, Arthopodium striatum, commonly called the Chocolate Lily, and Sowerbaea junco, known as the Vanilla lily both have good fragrance. The first a caramel chocolate perfume and the second vanilla scented flowers. Lomandra confertifolia varieties such as ‘Silver Grace and Seascape both have a nice scent. When in flower the grass trees or Xanthorrhoea has a sweet scent. Among the climbing plants, look for Hoya australis, with nicely perfumed flowers. 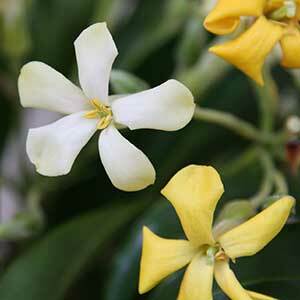 The native jasmin, Jasminium suavissimum also has perfumed flowers, a spicy sweet perfume. Some of the ground cover plants also have fragrance. Kunzea pomifera or Muntries is one. The native mint, Mentha australis has fragrant foliage when crushed or brushed against it gives of a distinct mint fragrance. Both Grevillea australis and Grevillea crithmifolia also have sweetly scented flowers. With shrubs, it is the Boronias that win hands down, and it is the foliage here that is the winner. Leptospermum liversigdgei and macropcarpum are two more. Many of the Prostanthera species, commonly called Mint Bush also have fragrant foliage. As we get to the trees the Acacias ave a few standouts, Acacia leprosa and howittii are two. Eucryphia lucida or Tasmanian Leatherwood has strong apple blossom scented flowers. When it comes to Eucalyptus, most have fragrant foliage, it is the smaller species that cat can be coppiced (cut back to the ground) that can be used in gardens with great effect. Look for E. viridis, Eucalyptus latens ‘Moon Lagoon’, and the smaller growing varieties of Eucalyptus gunnii. 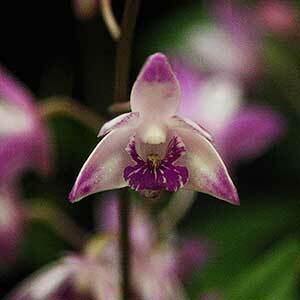 This list is far from exhaustive, however many of the native species mentioned, along with other fragrant plants can be easily used to add fragrance to the garden. Corymbia citriodora – This is a large tree, and it is the Lemon scented Gum, powerful fragrance on a summers day. Correa baeuerlenii commonly called the Chef’s Cap Correa, sweet fruity fragrance on unusual flowers. Eucalyptus polybractea, the Blue-leaved Mallee, for a eucalyptus fragrance its a winner. Melaleuca alternifolia, this is the plant that Tea Tree Oil comes from. Boronia megastigma the Brown Boronia is in our mind the best of the Boronias for frangrace. Arthropodium strictus or Chocolate Lily, mentioned previously.